Where would you start to create a basic app that when you air tap it takes a photo and stores it on device. The app will do more then that but that is where I need to start. Is there sample source code for this out there? 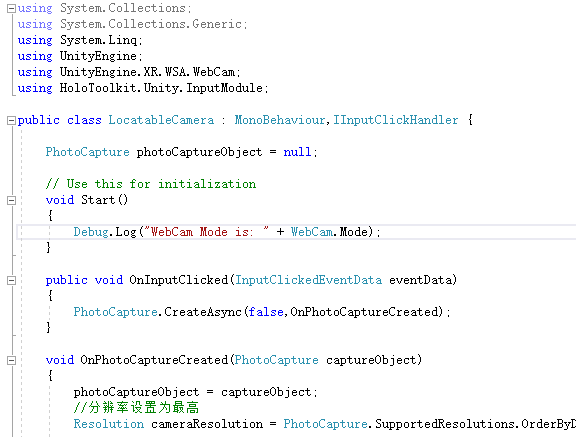 You can pretty much just copy and paste this Unity code for the locatable camera. The Unity code ? does it work with air tap gesture? I have writed code just like this,however it doesn't work on hololens. Can you give me some help? Thank you very much! @Xyy You need to add a listener to your object this is attached to. There is a script already written that does this called SetGlobalListener. You would use this if you just want to air tap anywhere in the scene to take a photo otherwise, you need to air tap on the object that has your script attached to it.